Gougères are a classical preparation often served at wine tastings in France. 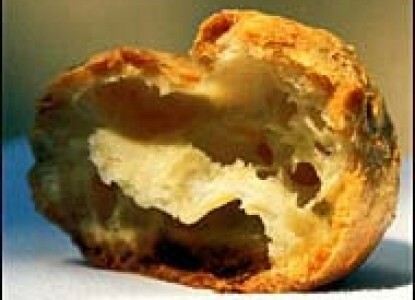 The puffs are made from a savory pâte á choux, or cream puff dough-flavored here with Gruyère. They are best served hot out of the oven. Don't add the cheese, and the puff is a base for a dessert. 1-1/4 cups grated Gruyère (5 ounces). Use the best quality cheese you can find. Preheat the oven to 450 degrees F. Line two baking sheets with Silpats or parchment paper. In a medium saucepan, combine the water (or skim milk), butter, salt, and sugar and bring to a boil. Add all the flour at once, reduce the heat to medium, and stir with a wooden spoon for 2 minutes, or until the mixture forms a ball and the excess moisture has evaporated (if the ball forms more quickly, continue to cook and stir for a full 2 minutes). Transfer the mixture to the bowl of a mixer fitted with the paddle and beat for about 30 seconds at medium speed to cool slightly (or if your arm is strong beat the mixture with a wooden spoon). Add 4 eggs one at a time and continue to mix until completely combined and the batter has a smooth, silky texture. The batter in the mixing bowl should form a peak with a tip that falls over. If it is too stiff, beat in the white of the remaining egg. Check again and, if necessary, add the yolk. Finally, mix in 3/4 cup of the Gruyère and adjust the seasoning with salt and white pepper. Using an oiled spoon drop one tablespoon of dough onto the sheet and repeat until the cookie sheet is full but not over-crowded. Fill the second sheet. Sprinkle the top of each gougère with about 1/2 teaspoon of the remaining grated cheese. Place first pan in the oven and bake for 7 to 8 minutes, or until they puff and hold their shape. Reduce the heat to 350 degrees F. and bake for an additional 20 to 25 minutes (at Beechwood Inn we have a double oven, so one is pre-heated to 450 the other to 350. We just move the first sheet to the 350 oven and add the second sheet to the hot oven. When the gougères are done, they should be a light golden brown color. When you break one open, it should be hollow; the inside should be cooked but still slightly moist. Serve the gougères while hot.